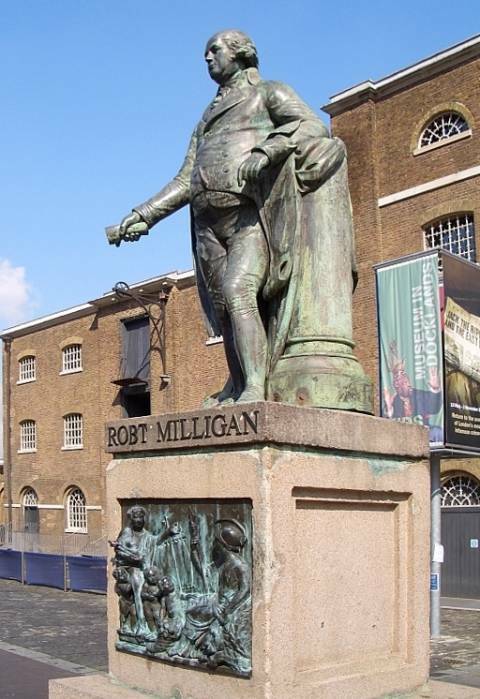 Milligan was Chairman of the West India Dock Company, and along with another leading merchant trader, George Hibbert (alderman of London 1798-1803), was a "leading proponent" for "completing the new dock scheme" (Hancock). According to the inscription on the plinth, it was to Milligan's "genius, perseverance and guardian care" that the docks here owed their "design, accomplishment and regulation." The bas-relief replaces an original one, since lost, of Britannia receiving Commerce. This one, said on the plinth to be based on Westmacott's design of 1813, apparently has the same figures: Britannia seated on her tame-looking British lion is hailed by the female figure of Commerce with cherubs at her feet. The central cherub trails a large horn of plenty. The mast of a sailing ship billows out in the centre background. The mood of confidence is unmistakable. But perhaps from a sculptural point of view, the most important and rather endearing feature of this monument is the statue's portliness: it is "a frank and unidealised representation of a merchant, thus anticipating Victorian bourgeois statuary" ("Robert Milligan"). Hancock, David. "Hibbert, George (1757-1837)." Oxford Dictionary of National Biography. Online ed. Viewed 12 August 2009. "Robert Milligan" (Public Monument and Sculpture Association site). Viewed 12 August 2009.